Yes, I’m back from almost a week in Canada visiting my friends in Vancouver and the FME UC at Whistler. First I’d like to thank Safe for the honor of giving the keynote. I enjoyed it thoroughly and meeting everyone there was an absolute blast. Both Don and Dale did a great job outlining how Safe was responding to the changing geospatial world. It really does become clear how well FME is able to bridge gaps in proprietary data ensuring it is easily accessible by all. 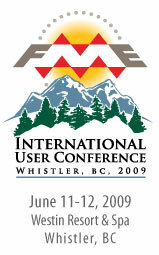 FME Server was definitely the focus of the conference and most people I bumped into really want to go that route. Remote processing is something that everyone can get behind, running scripts on your local desktop is not going to cut it anymore. The workshops and technical sessions were excellent (though I couldn’t go to every one I wanted to) and the word is that Safe will be posting the video and presentations this week on their website. I’m not sure if everything will be publicly available, but I’m sure the Don and Dale show will be and that alone is worth paying attention. The lightning talks were all excellent, Jeff Konnen talked about Rasters and FME Server, Glen Rhea talked about using FME to assist first responders during natural disasters, Peter Lauland showed some FME, SQL and TCL goodness and Paul Bissett showed how WeoGeo is scaling FME Server in the cloud to just clobber huge jobs (specifically they showed spinning up 64 FME engines to process worldwide tiling jobs). The welcome social was on top of Whistler Blackcomb Mountain and was quite an experience. I’ve never been to Whistler before and the views just blew me away. Seeing all the work for the 2010 Olympics (and how much more they have to do) was mind bending. And just the networking between users was also great. I really liked seeing how many different ways someone can complete the same task and what different software packages they are using. Much different from the ESRI/Intergraph/Autodesk conferences I’m used to going to. Best tool to get the job done is the rule and FME is usually at the center of it. I’ll try and post more about the conference this week as I recover and get back into the swing of things. I need to start preparing for the ESRI User Conference early next month and I’ve got some exciting plans for that so stay tuned.